XW AGS | Schneider | B.O.S. | DNM Solar Solutions Inc. The ConextTM Automatic Generator Start (AGS) can automatically activate or stop a generator in response to changing power requirements. 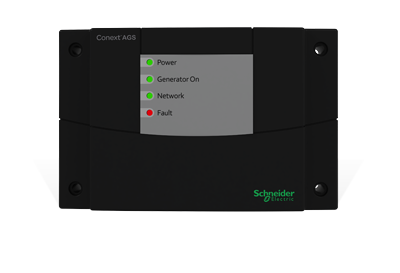 An excellent addition to an off-grid or backup power system, the AGS seamlessly connects to the XanbusTM network and shares status information with all other devices on the network. It can monitor a set of system user-programmable parameters such as battery voltage, state of charge or grid power and can activate the generator in response to any changes. The AGS can also be configured remotely using the Conext System Control Panel (SCP) or Conext ComBox to engage a generator, and can assist an inverter/charger when output power demands are high. Why choose Conext Automatic Generator Start?